0Aspergillus sp. is an ubiquitous fungus present in the environment and it causes pulmonary diseases in healthy and immunocompromised individuals with diverse clinical presentations - allergic bronchopulmonary aspergillosis (ABPA) in asthmatics, hypersensitivity pneumonitis in nonasthmatics, saprophytic colonization in the form of aspergilloma in preexisting pulmonary cavities, invasive disseminated aspergillosis and chronic necrotizing pneumonia in immunosuppressed patients. ABPA is an immunologically mediated pulmonary disease caused mainly by immunoglobulin E (IgE)-mediated type I, but also immunoglobulin G (IgG)-mediated type III and cell mediated type IV hypersensitivity reactions are involved. It occurs predominantly in asthmatics. Incidence of ABPA in asthmatics is 2.5-12.9%. , Fleeting pulmonary infiltrates in patients with poorly controlled asthma are the main clinical presentations of ABPA, and central bronchiectasis is an important radiological feature. 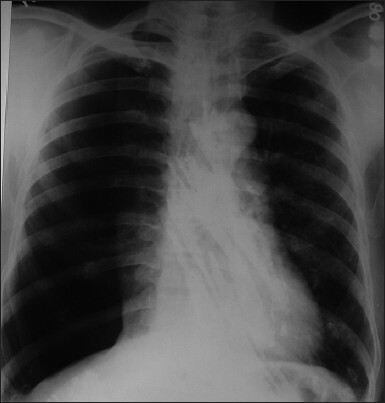 Here, we report a case of ABPA in an 18-year-old male asthmatic patient with two unusual clinical presentations - right sided pneumothorax and right upper lobe collapse. An 18-year-old nonsmoker male patient presented in the emergency department with the sudden increase of breathlessness and right sided pleuritic chest pain for 1 day. On detailed enquiry, it was revealed that a history of intermittent breathlessness, dry cough, fever, wheezes, were present for last 2 years, mostly in the early morning. Episodic increase in respiratory symptoms mainly just before the winter was noticed by the patient, but unlike the present one, all were sub-acute in onset. There was no past history of pulmonary tuberculosis. The patient had the history of allergic rhino-conjunctivitis and gastro-esophageal reflux. There was no family history of atopy or asthma. On examination, there was no cyanosis, and edema. His pulse rate was 124 beats/min, respiratory rate, 28 breaths/min, temperature 37°C, and blood pressure, 100/64 mmHg. Examination of the respiratory system revealed left sided mediastinal shifting, hyper-resonance percussion note, absent breath sound, and reduced vocal resonance on the right side - suggestive of right sided pneumothorax. Diffuse wheezes were audible on the left side, along with few crackles. Complete hemogram and blood biochemistry were within normal limit, except absolute eosinophil count was 1264/cumm. Chest X-ray - posteroanterior (P.A.) view revealed right sided pneumothorax [Figure 1]. Blood for antiHIV-1 and -2 antibodies was negative. The patient was treated with oxygen, nebulized bronchodilators, co-amoxyclav tablet (625 mg 3 times daily), oral prednisolone (40 mg once daily), and water-seal intercostal tube drainage through the 4 th intercostal space at right mid-axillary line. When the pneumothorax was resolved, high-resolution computed tomography (HRCT) of thorax was done, which revealed proximal bronchiectasis, hyperinflation, and air trapping [Figure 2]. Spirometry showed fully reversible obstructive ventilatory defect. On discharge, the patient was advised with salmeterol + fluticasone (50 + 500 mcg) capsule - one capsule twice daily with dry powder inhaler along with single daily dose of tablet montelukast + levocetirizine (10 mg + 5 mg) and single daily dose of tablet pantoprazole (40 mg). Despite full compliance and correct inhaler technique, his shortness of breath, cough, and wheezes were marginally reduced. As there were peripheral blood eosinophilia and proximal bronchiectasis on CT, total IgE, Aspergillus - specific IgE, and Aspergillus skin test were done to rule out ABPA. Total IgE was 2233 IU/L, Aspergillus specific IgE, and Aspergillus skin test was positive. Sputum for fungal stain was negative. Tablet prednisolone (30 mg) once daily and capsule itraconazole (100 mg) - two capsules twice daily for 6 weeks were added for ABPA. Two months later, the patient again presented with sudden onset breathlessness, mucopurulent expectoration, and fever for last 2 days, although his respiratory symptoms had been well-controlled 2 days back. On examination, the patient had cyanosis, pulse rate was 132 beats/min. respiratory rate, 32 breaths/min., temperature, 37°C, blood pressure, 110/74 mmHg, and oxygen saturation in capillary blood (SpO 2 ), 82% on room air. Examination of the respiratory system revealed only tracheal shift to the right side, impaired percussion note over second, third, and fourth intercostal spaces (ICS) at right mid-clavicular line, and over fourth and fifth ICS at right mid-axillary line, absent breath sound and reduced vocal resonance over right infra-clavicular area - suggestive of right upper lobe collapse. Diffuse wheezes and coarse crackles were present over all other areas. Urgent portable chest X-ray revealed right upper lobe collapse [Figure 3]. Immediate fiberoptic bronchoscopy showed that a thick mucus plug occluded the opening of the right upper lobe bronchus. Bronchoscopic removal of brownish-black mucus plug improved the SpO 2 . Postbronchoscopy chest X-ray was normal. Only abnormality was revealed on bronchoalveolar lavage fluid study was eosinophilia (20%). Fungal stain of removed mucus plug showed fungal hyphae. The patient was discharged with adequate control of his asthmatic symptoms. On follow-up, symptoms of the patient were well-controlled with inhaled salmeterol + fluticasone (50 mcg + 500 mcg), oral montelukast + levocetirizine, tapering dose of prednisolone, and itraconazole. Dose of the itraconazole was reduced to 100 mg twice daily after 6 weeks and continued for another 6 weeks. Dose of the prednisolone was reduced to 10 mg once daily and was continued for 1-year and montelukast + levocetirizine was stopped after 12 weeks. Finally, the patient was maintained with inhaled salmeterol + fluticasone only. Diagnostic criteria of ABPA are as follows. In our case, the patient presented with uncontrolled asthma despite his strict compliance to highest possible management for asthma. Presence of elevated total IgE, Aspergillus - specific IgE, positive skin test to Aspergillus antigen, central bronchiectasis on CT, and peripheral blood eosinophilia confirms the diagnosis of ABPA. Besides that, two unusual clinical presentations of ABPA - pneumothorax and right upper lobe atelectasis were reported in our case. As per Patterson et al. there are five stages of ABPA: Stage I - acute, II - remission, III - exacerbation, IV - corticosteroid-dependent asthma, and V - fibrotic lung disease. Cylindrical bronchiectasis of the central airways is the characteristic features of ABPA. Dilated segmental and sub-segmental airways, predominantly in upper lobes, may be occluded by impacted mucus containing Aspergillus hyphae, mainly in the acute and exacerbation stages. 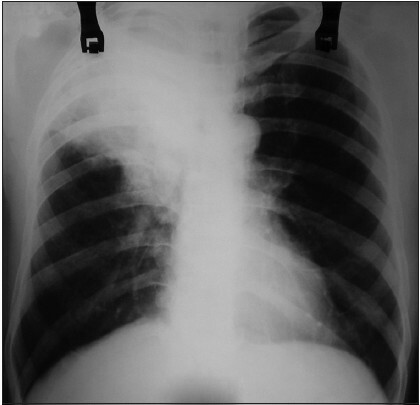 Complete obstruction of these affected bronchi leads to transient or persistent atelectasis of a segment or a lobe. The walls of the affected airways are infiltrated with eosinophils, lymphocytes, and plasma cells. The airway lumen is occluded by mucus containing hyphal elements, and inflammatory cells, mainly eosinophils. Secondary spontaneous pneumothorax due to ABPA is treated by intercostal tube drainage, antibiotic, and management of ABPA should be continued. On the other hand, segmental and lobar collapse due to "mucoid impaction" should be managed by nebulization with hypertonic saline (3%) to decrease the viscosity of mucus to ease its expectoration and urgent fibreoptic bronchoscopy should be done for removal of thick mucus plug from the segmental and sub-segmental bronchi. 1. Denning DW, Pleuvry A, Cole DC. Global burden of allergic bronchopulmonary aspergillosis with asthma and its complication chronic pulmonary aspergillosis in adults. Med Mycol 2013;51:361-70. 2. Agarwal R, Aggarwal AN, Gupta D, Jindal SK. Aspergillus hypersensitivity and allergic bronchopulmonary aspergillosis in patients with bronchial asthma: Systematic review and meta-analysis. Int J Tuberc Lung Dis 2009;13:936-44. 3. Hinson KF, moon aj, Plummer NS. 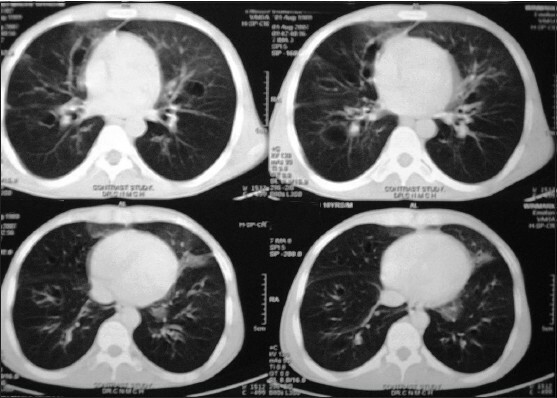 Broncho-pulmonary aspergillosis; a review and a report of eight new cases. Thorax 1952;7:317-33. 4. Diwakar A, Panjabi C, Shah A. Allergic bronchopulmonary aspergillosis, allergic Aspergillus sinusitis and their co-occurrence. Open Allergy J 2008;1:52-61. 5. Shah A. Allergic bronchopulmonary and sinus aspergillosis: The roentgenologic spectrum. Front Biosci 2003;8:e138-46. 6. Agarwal R, Maskey D, Aggarwal AN, Saikia B, Garg M, Gupta D, et al. Diagnostic performance of various tests and criteria employed in allergic bronchopulmonary aspergillosis: A latent class analysis. PLoS One 2013;8:e61105. 7. Patterson R, Greenberger PA, Radin RC, Roberts M. Allergic bronchopulmonary aspergillosis: Staging as an aid to management. Ann Intern Med 1982;96:286-91. 8. Menzies D, Holmes L, McCumesky G, Prys-Picard C, Niven R. Aspergillus sensitization is associated with airflow limitation and bronchiectasis in severe asthma. Allergy 2011;66:679-85. 9. Agarwal R, Gupta D, Aggarwal AN, Behera D, Jinda SK. Allergic bronchopulmonary aspergillosis: Lessons from 126 patients attending a chest clinic in North India. Chest 2006;130:442-8. 10. Agarwal R, Khan A, Garg M, Aggarwal AN, Gupta D. Pictorial essay: Allergic bronchopulmonary aspergillosis. Indian J Radiol Imaging 2011;21:242-52. 11. Judson MA, Marshall C, Beale G, Holt JB. Pneumothorax and bronchopleural fistula during treatment of allergic bronchopulmonary aspergillosis. South Med J 1993;86:1061-3. 12. Nowicka U, Wiatr E, Jakubowska L, Polubiec-Kownacka M. Allergic bronchopulmonary aspergillosis mimicking lung cancer in patients without bronchial asthma - Case report. Pneumonol Alergol Pol 2012;80:77-81.